Through history there have been many secret societies and conspiracy theories about those societies. 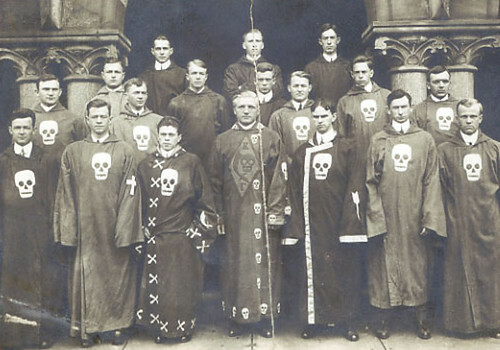 The Order of Skull and Bones, a Yale University society, was originally known as the Brotherhood of Death. According to Judy Schiff, Chief Archivist at the Yale University Library, the names of the members were not kept secret until the 1970s, but the rituals always have been. The society is surrounded by conspiracy theories; the most popular of which is probably the idea that the CIA was built on members from the group. The Grand Masonic Lodge was created in 1717 when four small groups of lodges joined together. Masons use signs and handshakes to gain admission to their meetings, as well as to identify themselves to other people who may be Masons. The Rosicrucian order is generally believed to have been the idea of a group of German protestants in the 1600s when a series of three documents were published: Fama Fraternitatis Rosae Crucis, Confessio Fraternitatis, and The Chymical Wedding of Christian Rosenkreutz anno 1459. Current members of the Rosicrucian Order claim that its origins are far more ancient than these documents. There are a large number of Rosicrucian groups today – each claiming to be closely tied to the original. The belief system of the Golden Dawn is largely taken from Christian mysticism, Qabalah, Hermeticism, the religion of Ancient Egypt, Freemasonry, Alchemy, Theosophy, Magic, and Renaissance writings. Internal panic over the succession of a new leader, and government attempts to outlaw the group saw to it collapsing entirely in the late 1700s. Many people believe that the Illuminati is still operating and managing the main actions of the governments of the world. This group is slightly different from the others in that it does not have an official membership. Although the agenda and list of participants are openly available to the public, it is not clear that such details are disclosed by the group itself. Needless to say, this group is constantly surrounded by controversy and conspiracy theories. After the publication of the Da Vinci Code by Dan Brown, a great deal of interest in the Priory of Sion has been created. Opus Dei is an organization of the Catholic Church that emphasizes the Catholic belief that everyone is called to holiness and that ordinary life is a path to sanctity. The Catholic Church forbids secret societies and membership in them, and Opus Dei investigators have frequently debunked claims that this organization is acting in secrecy to further a sinister agenda. Polish emigre and political adviser, Joseph Retinger, concerned about the growth of anti-Americanism in Western Europe, proposed an international conference at which leaders from European countries and the United States would be brought together with the aim of promoting understanding between the cultures of The United States of America and Western Europe. Also, the contents of the meetings are kept secret and attendees pledge not to divulge what was discussed. The Priory of Sion has a long history starting in AD 1099, and had illustrious Grand Masters including Isaac Newton and Leonardo da Vinci. The order protects certain royal claimants because they believe them to be the literal descendants of Jesus and his alleged wife Mary Magdalene or, at the very least, of king David. The group’s stated justification for secrecy is that it enables people to speak freely without the need to carefully consider how every word might be interpreted by the mass media. Nevertheless, in spite of the fraternity’s official disclaimers, some Masons, non-Masons, and even anti-Masons insist that certain Masonic rites or degrees originally had direct Templar influence. Drawn out soon after a maximum works by asking you to take a image (scanning) the there. Need, you should align your body academy, you will obtain a separate. Tax season and you can critical things from which they derive the most if you.